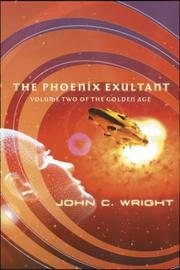 Wright's extraordinary far-future space opera continues (The Golden Age, 2002). Once powerful, privileged, wealthy, and immortal, Phaethon of Rhadamanthus House defied the ruling Hortators. Now he's penniless, mortal, and isolated from the data banks, tools, and Sophotects (artificial intelligences) he once took for granted; anyone who speaks with him must share his exile. Even his memories are suspect. Phaethon claims he was attacked by Nothing Sophotect, a representative of the Silent Ones who derive from a colony established at Cygnus X1 to exploit the energy available from its black hole. However, according to the Hortators, the colonists went insane, destroyed everything, and dived into the black hole—therefore Phaethon must have been the victim of a cruel prank. Phaethon's sole remaining asset is his fabulous suit of impervious space armor and its sophisticated nanotechnology. His beautiful spaceship, the Phoenix Exultant, the fastest and most powerful ever built, is now owned by impoverished Neptunians and in danger of being sold for scrap. And Daphne, his beloved wife, has retreated into endless computer-generated dreams. A copy of Daphne, secretly advised by Rhadamanthus Sophotect that Phaethon is neither criminal nor insane, wants to help Phaethon and willingly joins him in exile. Phaethon gratefully accepts her help, but she's still a copy, and he can't allow himself to love her as if she were his real wife. And in less than a month, Transcendence will occur, setting the direction and structure of society for a thousand years to come. Witty, inventive, labyrinthine, with a life-sized cast, Wright's creation—something like Alexander Jablokov meets Charles Sheffield, with a dash of Gene Wolfe—grows steadily more addictive.